From the critically acclaimed developer, Naughty Dog, comes the first standalone adventure in the Uncharted series. Fan-favorite character, Chloe Frazer, must enlist the aid of renowned mercenary Nadine Ross from Uncharted 4: A Thief’s End in order to recover a fabled ancient Indian artifact and keep it out of the hands of a ruthless war profiteer. Together, they’ll venture deep into the mountains of India in search of the legendary artifact. Along the way, they’ll learn to work together to unearth the mystery of the artifact, fight their way through fierce opposition, and prevent the region from falling into chaos. One of the most popular characters in the series, Chloe Frazer was first introduced in Uncharted 2: Among Thieves and last appeared in Uncharted 3: Drake’s Deception. Chloe is a notorious treasure hunter whose wit, archeological knowledge, and improvisational nature rivals Nathan Drake’s. She has a reputation for being both great in a fight and behind the wheel. Chloe is impulsive and improvisational, relying largely on her wits. Her methods often blur moral lines but always yield results, putting her in high demand. However, she has her limits, and when a situation starts to go south, she’s unafraid to cut her losses. Nadine Ross made her first appearance in Uncharted 4: A Thief’s End as the leader of Shoreline, a South African paramilitary organization hired by the story’s primary antagonist Rafe Adler. Following the dissolution of Shoreline after the events in Uncharted 4, Nadine Ross has become a free agent and gun-for-hire. Nadine is known for her calm, calculated approach to every job and every fight. She insists on having the upper hand at all times and never fails to deliver. Building upon the critically acclaimed gameplay and storytelling of Uncharted 4: A Thief’s End, Uncharted: The Lost Legacy features all of the hallmarks of the series, including a rich cinematic story, exotic new destinations, intricate puzzles, and action-packed set pieces. Uncharted: The Lost Legacy will be the first ever standalone release in history of the Uncharted series and will be our most substantial story expansion to date. It will be available as a standalone game on store shelves and for digital download. If you have already purchased the Uncharted 4 Digital Deluxe Edition or the Explorer’s Pack, you will get Uncharted: The Lost Legacy as a download at launch. ©2007-2015 Sony Interactive Entertainment America LLC. 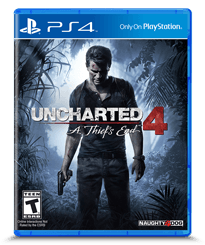 UNCHARTED 4 A Thief’s End, UNCHARTED The Nathan Drake Collection, UNCHARTED Drake’s Fortune, UNCHARTED 2 Among Thieves, and UNCHARTED 3 Drake’s Deception are trademarks of Sony Interactive Entertainment America LLC. "PlayStation" and the "PS" Family logo are registered trademarks of Sony Interactive Entertainment Inc.